Have you ever heard a knock at your door after a large storm and found a contractor trying to sell you their services? These storm-chasing solicitors are fairly common, but they may not be the most reliable. While it may seem convenient to hire one of these contractors at the time, if you’re not careful, you may find yourself in a binding contract with a large cancellation fee. The first thing you should do after a loss is contact your insurance company or Independent Insurance Agent to start the claims process. It’s best to have your insurance company assess the damage first to avoid having to pay for additional work that isn’t necessary or that isn’t covered. After filing a claim, you should then contact a trusted contractor of your choice to repair the damage. Your Independent Insurance Agent and Insurance Company can help. If you aren’t sure where to start looking, your insurance company or your Independent Insurance Agent can provide suggestions for trusted contractors who they or their clients have worked with in the past. Be patient and avoid door-to-door contractors. Someone knocking at your door and offering you their services right away after a storm may seem convenient, but you want to be sure that you are making an informed decision on your choice of contractor. It’s best to err on the side of caution and only accept bids from local contractors who you have contacted yourself. Check with your insurance company or Independent Insurance Agent on the amount of time your policy allows for repairs. Unless your roof is leaking, it may be best to wait until the rush after a storm is over, when your local contractors are less busy. If a contractor does come to your door, don’t sign anything. You may be led to believe that you are just signing an estimate or a form that allows the contractor onto your property; but in many cases, it’s a binding contract that can include a cancellation clause up to 20%. Review your local contractor’s business history. Along with asking friends and neighbors for references, a good rule of thumb is to make sure that a contractor has been in business in your community for at least as long as the warranty they offer you. Make sure the agreement clearly states the materials being used, the labor being performed, the terms of payment, and who is responsible for permits. Ask for copies of the contractor’s Workers’ Compensation and General Liability insurance. Review the contract and check the fine print. Never sign a contract with a cancellation fee or unfilled, blank spaces. If there are any blank spaces on a contract, terms could be added later to which you didn’t agree. 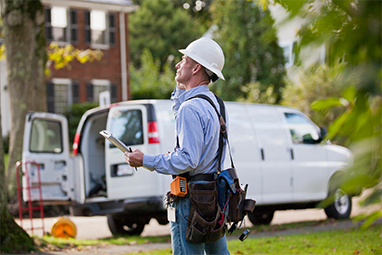 If you have any questions about how to find a reliable contractor, ask your professional Independent Insurance Agent or contact your insurance company. To locate an Independent Insurance Agent near you, click here.